I’m at the Kenyon Writers Workshop right now, indulging in a week focused on writing and fulfilling my obligations as a fellow. Among those obligations was giving a reading along with the other eight fellows Sunday night. I knew exactly which piece I was going to read, an excerpt from my memoir manuscript that was recently accepted by the Wall Street Journal for their Mansion section. With 800 words it took up less than the eight minutes each one of us was allotted. I am always nervous about reading my work in front of an auditorium full of people. No matter how much I practice reading the piece, when I step up to the podium, my heart is racing, my fingers shake, and my voice sounds unsteady to me, even if it doesn’t to the audience. Still, I made it through, and many people complimented me on the piece afterwards, and even approached me the next day to say something they appreciated about it. After all that nervous exertion, those accolades made me feel uplifted. 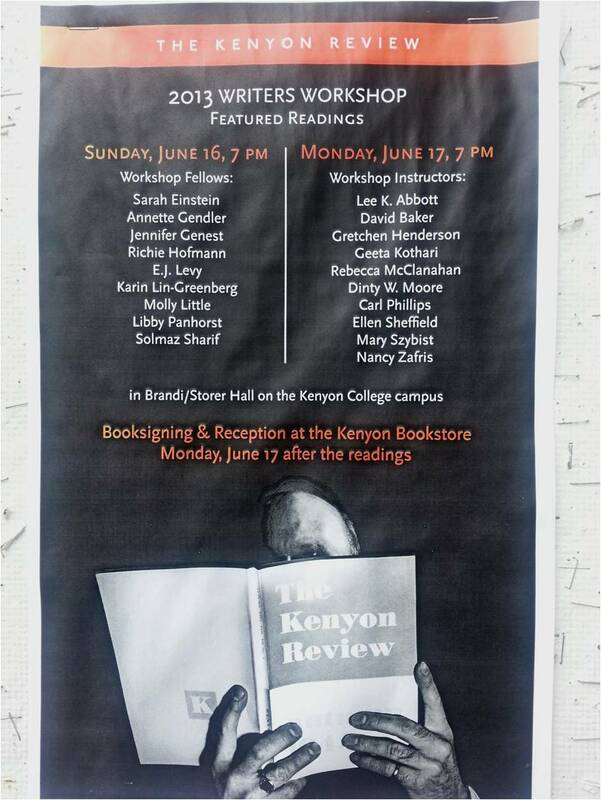 But before the reading, as I was walking the main “drag” of the Kenyon College Campus to my apartment accommodations, I passed by this poster, copies of which were affixed to the columns of the bookstore porch, and I spotted my name. I thought to myself, “Yes, aha, that’s me. My name is on a poster. I’m reading tonight.” In a way it was as if I were looking in a mirror: Yes, I am a writer, and I am here as a fellow, and I am reading. And that was oddly reassuring even before I had delivered. Lucky you, Annette, getting to assist your former professor Rebecca McClanahan in the nonfiction workshop part of the Kenyon Writers Workshop and read a part of you memoir manuscript at the Sunday night readings. I am sure you have been having a wonderful week. Barbara – thanks for commenting. I am indeed having a most productive and inspiring week! I'm intrigued, Annette, by the fact that part of your memoir fits in that part of the WSJ. Please give us a recap just so we can see your story as part of great architecture of the world. Or certainly let us know when it comes out. I can certainly see having that feeling, Annette!